The symptoms are common. They include : faster heart rare, pounding of the heart, palpitations, shortness of breath, muscle tension, tingling, dizziness, dry mouth, and severe itching, among a host of others. We all share some of the ill effects that arise from anxiety that triggers into panic. We lose our ability to concentrate, have a negative feeling about ourselves and the world, become restless and easily fatigued, we are fearful and always on guard that something will go wrong. The glass is always half empty. Oftentimes we aren’t even aware of the trigger that precipitated the attack but can bring it on ourselves by remembering a traumatic event. I have recently watch a TED talk with Dr. Daniel Amen whose works I have often cited in the past. He speaks of the function of our brain and ways in which to change it, in particular using computer technology, as neuro-feedback in which a person can receive moment to moment feedback of physiological functioning of the central nervous system and the brain. He speaks of the ‘Brain Smart Program’ as a way in which the imaging can provide the person with information to help in the process of changing the brain. In his view psychiatrists are the only medical specialists who never look at the organ they are treating. But with imaging, those who are working with people with such conditions as anxiety can receive immediate feedback about the state of their brains. In my view it is a state above talk therapy which is helpful as a first step toward understanding the root cause of anxiety, depression and panic attacks. Fibromyalgia is extreme anxiety of an ultra sensitive person in which the CNS is in a state of hyper-arousal, often resulting in panic attacks. What better ways of working with changing our brains than uncovering the mystery of our condition and actually seeing the state of our CNS and brain? Anxiety= panic= flare-ups. There IS hope: After finding someone who is a good therapist, cut down on caffeine and sugar, avoid alcohol, practice breathing exercises, engage in a movement exercise such as walking, and Chi Gong, or gentle yoga, practice being aware of triggers that cause flare-ups, and avoid becoming overly stressed and excited. Above all, meditate regularly and practice mindfulness during your waking hours, but then I have written extensively about mindfulness on these blogs and risk boring readers! 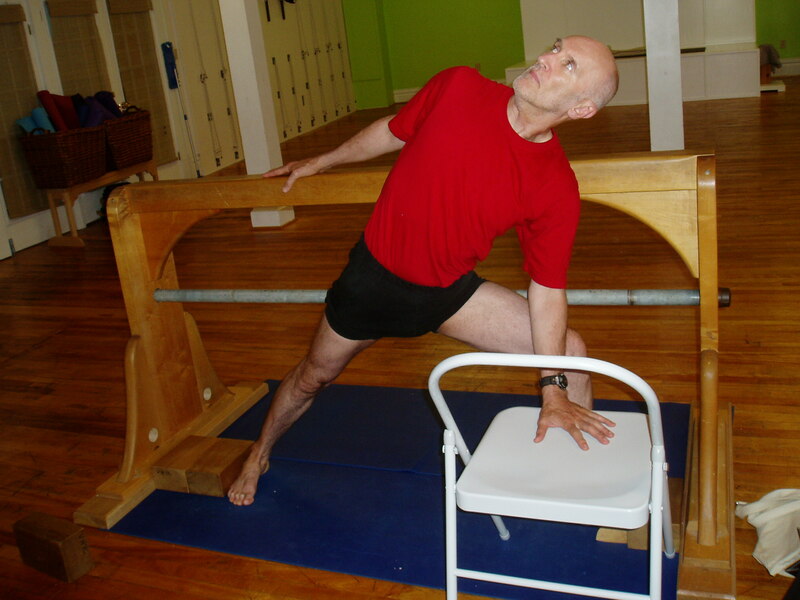 Here I present my former yoga teacher David in an Iyengar supportive yoga pose.